It seems that F1 Hotel in BGC has done it again. Believe it or not, it is now their 5th year celebrating the LUZVIMINDA FILIPINO FOOD FESTIVAL. For something to reach this long, it says a lot about how awesome their celebration is year after year. Just in time for Independence Day, they brought out the best and brightest to serve their guests. Let's see how it goes. A fusion of flavors, this time F1 HOTEL has invited three prestigious and well acclaimed chefs to spear head this endeavor. Chef Mikel Zaguirre for Luzon, Chef Dennis Uy for Visayas, and Chef Kalel Chan for Mindanao. Each of them having years of experience made sure to bring out different delicacies with a twist. 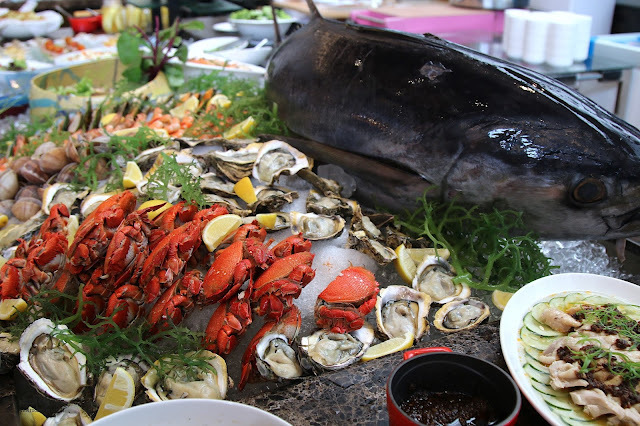 Right off the bat, they prepared a gorgeous fresh seafood and grill section. 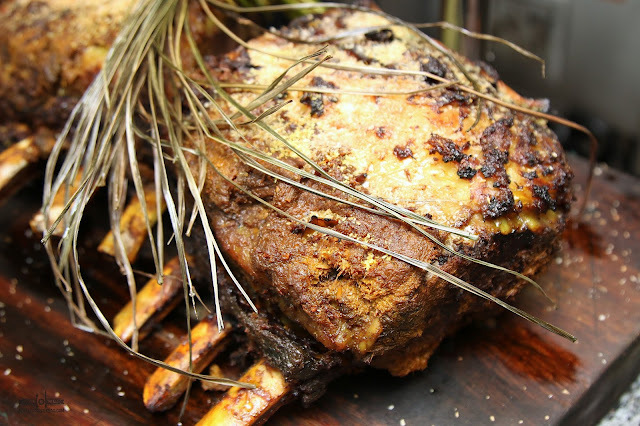 Guests are encouraged to get a couple and ask them to be cooked based on their preference. This is where the familiar buffet set up stops. 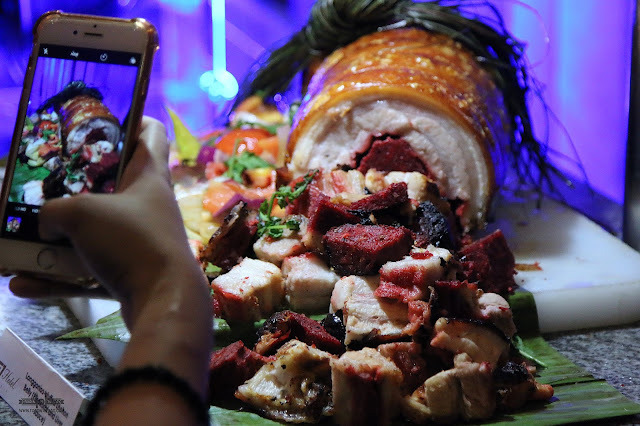 Different items were laid on the spread to entice and get foodies excited about the new and innovative dishes to try out from different regions of the Philippines. 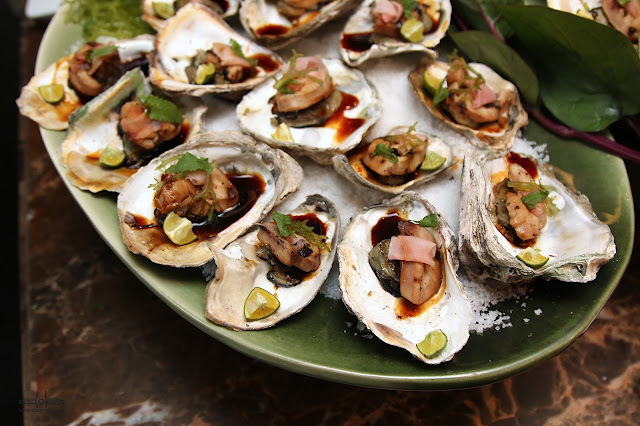 Even if oysters are supposed to be eaten with a full stomach, you must get your hands on these GRILLED BAGAYBAY on OYTERS. One quick chat with Chef Kalel and it made my curiosity squirm with delight. "Remember to swallow", he said. TO the uninitiated, the Bagaybay is basically fish sperm. Granted that it sounds weird to try this out, don't let it hinder you. The flavors and the texture goes well with each other. Believe me, you won't regret getting a couple. Hard to describe, yet tremendously delicious would be the BALAW-BALAW. Another name for this dish would NILATIK NA HIPON. Quite weird but dastardly genius. I just caught myself getting more of this as it goes well with hot steaming rice. 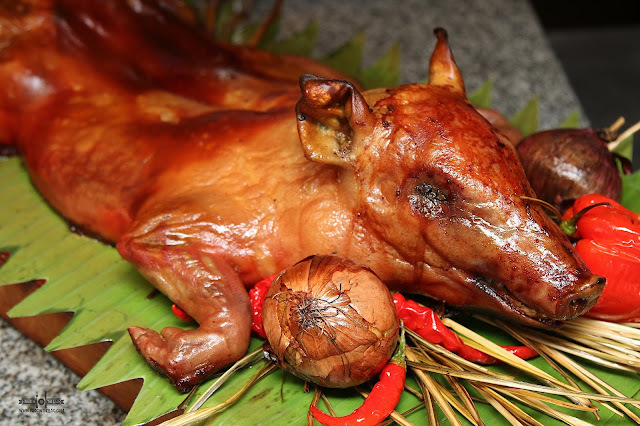 Who would have thought to do this to crispy pata? 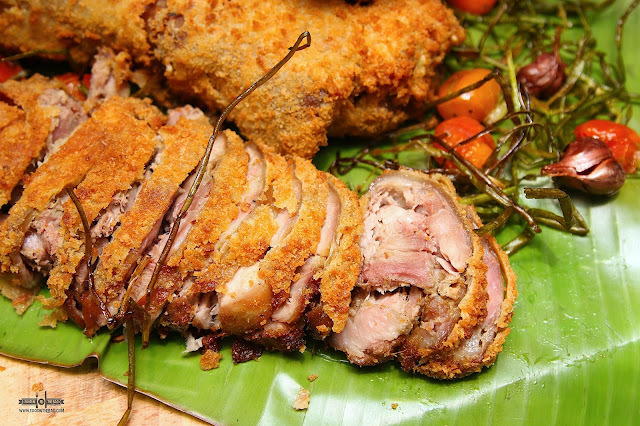 The CRISPY PATA ROULADE by CHEF MIKEL made buffet lovers line up over and over again just to get these. Deep fried exterior but its meat is quite tender. 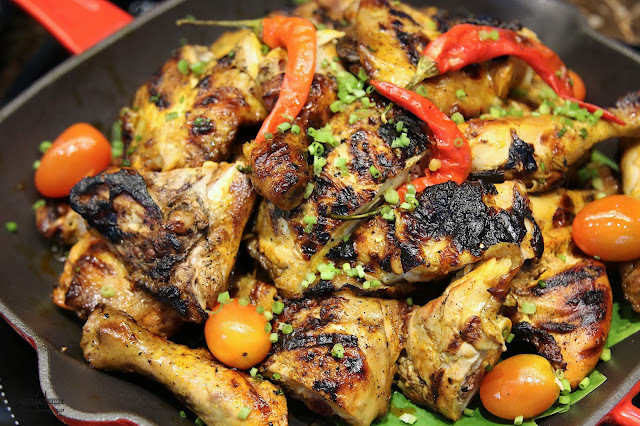 The CHICKEN INASAL is another dish from Chef Dennis. Giving a vivid surprise to taste buds, there is something special about this grilled chicken. The flavors are all absorbed properly by the meat. Another traditional dish would be the HUMBA. 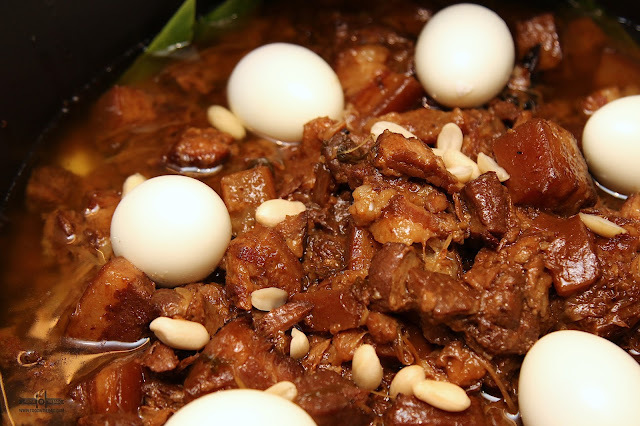 A sweet pork that is quite similar to the Adobo in terms of appearance. But, it ends there as the sauce and the meat is sweeter than usual. 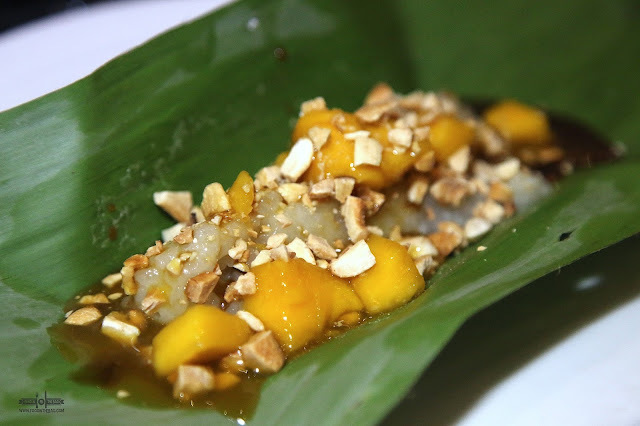 In other regions, this is served with pineapple as a way to make it fruitier. A block buster would be the RIBEYE RENDANG. The RIBEYE was worth the line up. 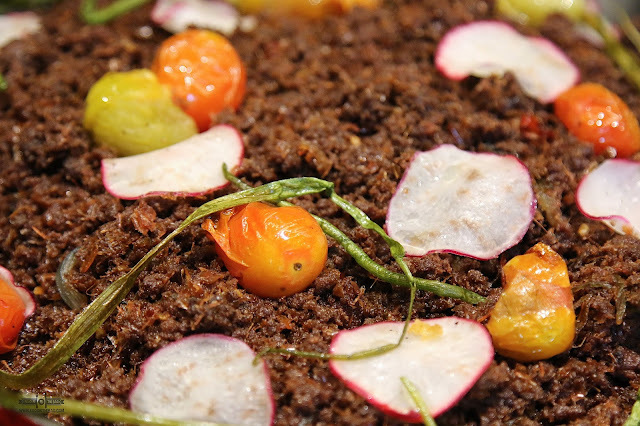 Smooth and soft meat partnered with a spicy rendang flavor. This was a crowd favorite. Aside from these dishes, different appetizers and short plates were prepared. More so they even have GINATAANG CURACHA SA ALIGUE, KBL, a 30 Hour Sous Vide Adobo with Ginata, BULALO STATION with huge grilled bone marrow, and a PHYLLO WRAPPED SALMON served with ITLOG NA MAALAT SAUCE. Dessert was also well thought off as traditional flavors were given different interpretation. 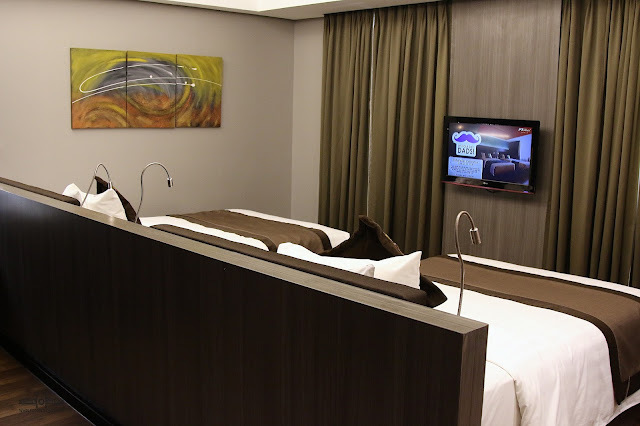 A visit to F1 HOTEL would not be complete without a stay in one of their rooms. 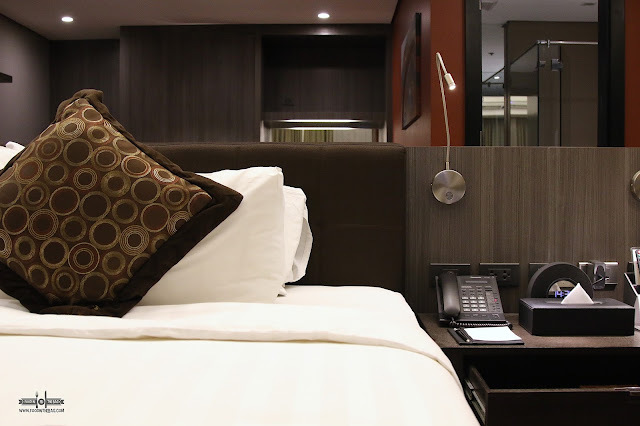 The CITY SUITE ROOM is perfect for a family or a group of friends wanting space, leisure, and relaxation. A divider separates the beds from a lounge that also has its own television and sofa. Gatherings are also perfect in F1 Hotel. With huge conference space and ball rooms to use, one can't help but enjoy the stay. Very accessible and quite glamorous, these ballrooms could cater to a small group of 30 to as big as a few hundred guests. 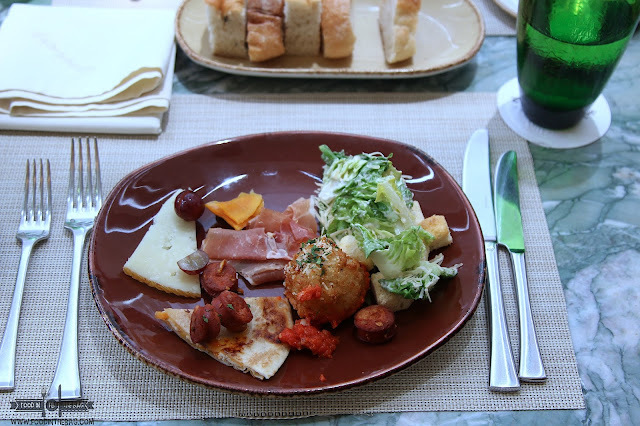 For dinner, F1 hotel graciously prepared a number of dishes that is perfect for everyone. 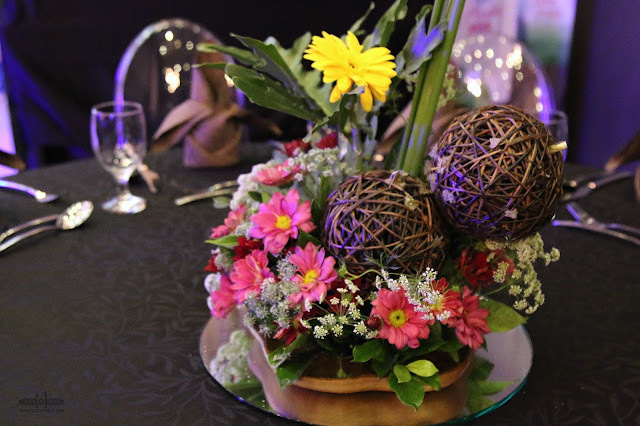 Aside from appetizers like the DINUGUAN VOL AU VENT and the BACON CHEESE LUMPIA, other creative dishes were served. 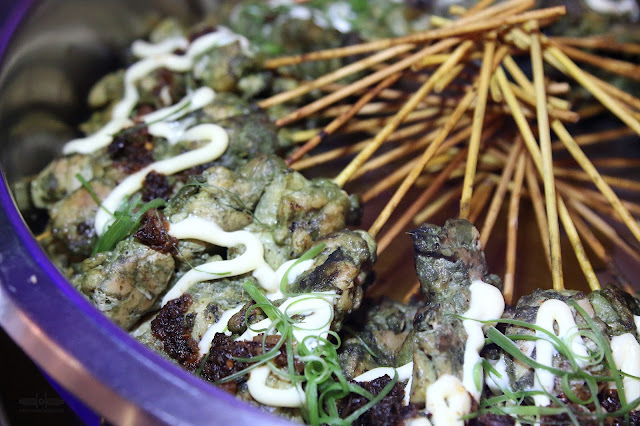 The CHICKEN PIYANGGANG SKEWERS were heavy favorites as they were easy to eat and filled with depth. The burnt coconut gave the chicken more flavor. 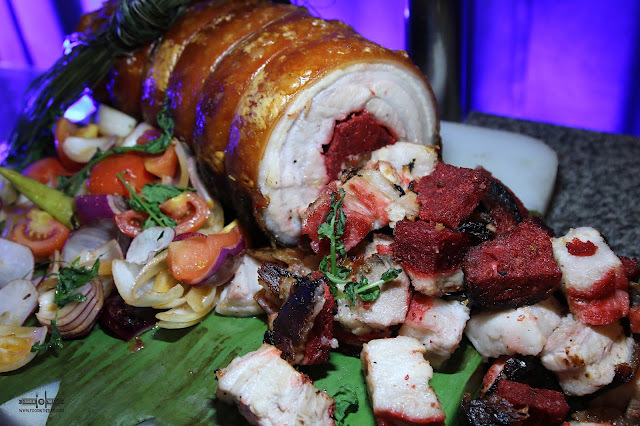 Another genius creation would be the LONGGANISA STUFFED LECHON BELLY. Crispy skin and tender meat greeted each bite. The sausage gave off a little sweet surprise to the salty dish. This was just amazing. For drinks, F1 Hotel got you covered as well. 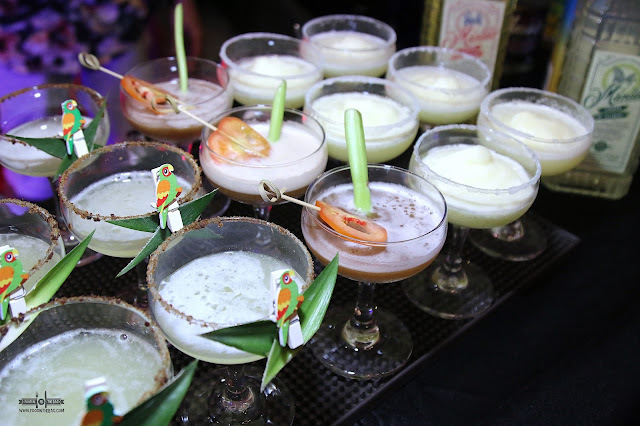 In partnership with DESTILERIA LIMTUACO, they have created different solid and devilish cocktails to make you enjoy the party more. 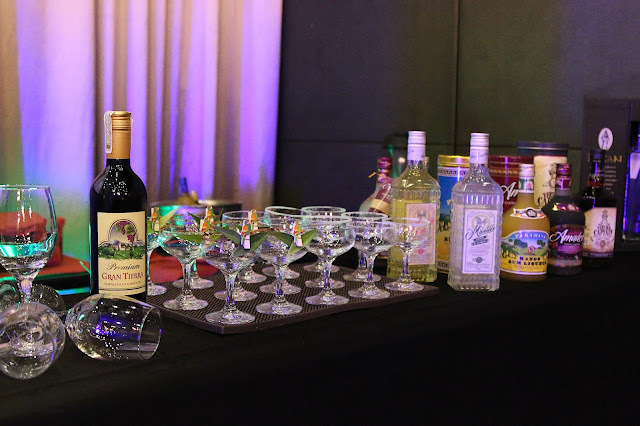 From GREEN MANGO flavored drink to SINIGANG and even Pineapple, these refreshing delights are just what the doctor ordered. Considered as sweet, sour, and even savory, these are great concoctions that would make your mother proud. If you have the time, I dare you to try out their INTRAMUROS. It's a sweet chocolate drink that you would enjoy. 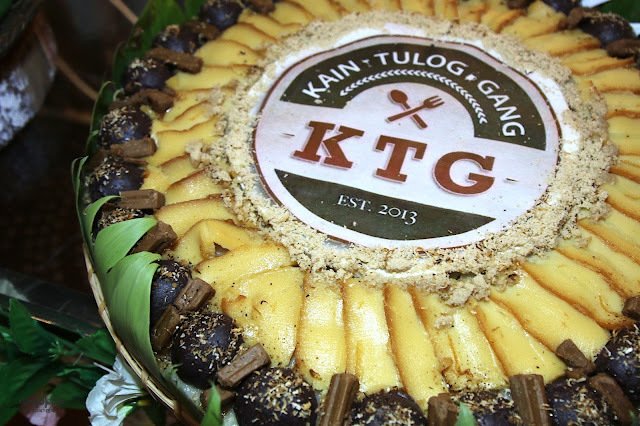 It was even incredible of them to create this huge BILAO or circular basket filled with sticky and sweet rice dessert creation. It was an independence day weekend worthy of another re-run. The dishes served made it very memorable as this has got to be an underrated foodie event. With Chef MIKEL, DENNIS and KALEL, you won't have to worry about the delightful spread they have in store for you. 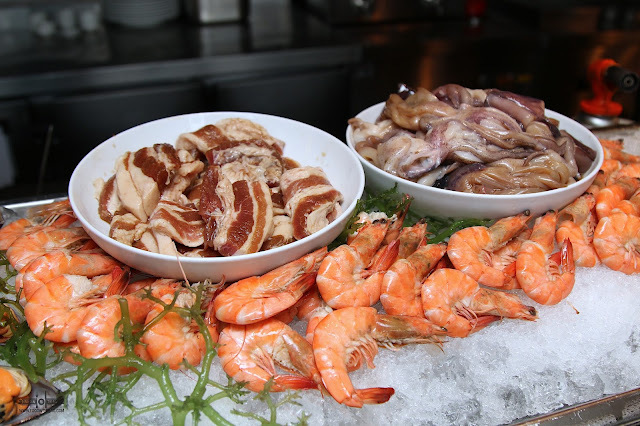 The LUZVIMINDA BUFFET would run up until June 30. I would suggest you order one of those limited edition cocktails as they would go well with the dishes as well.